Below you can view all the homes for sale in the Links At Brookstone subdivision located in Acworth Georgia. Listings in Links At Brookstone are updated daily from data we receive from the Atlanta multiple listing service. To learn more about any of these homes or to receive custom notifications when a new property is listed for sale in Links At Brookstone, give us a call at 404-998-4102. 3-Sided Brick/Stone Design!Screen Porch, Patio, Deck, Private Level Yd And Driveway- Excellent Condition,Lovingly Maintained! West Cobbs Best Schools! MLS#6524063. Re/Max Pure. Wired With Cat 5E And Fiber. 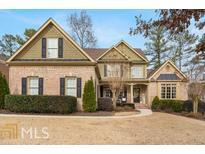 MLS#8502928. Atlanta Communities. Terrace Level Offers Theater, Gym, Kitchenette, Office/Craft Room, Screened In Porch And Patio W/Fire Pit. New Hvac|Roof. Cat5E & Fiber Wired. MLS#6114761. Atlanta Communities. The Interior Boast Heavy Custom Millwork W/5" Solid Wood Floors And Oversized rooms Making This House Perfect For Entertaining. Show It Today! MLS#6106305. Century 21 Results.